Because I was playing tennis on Saturday evening, dinner had to be quick and easy to prepare when I returned home. 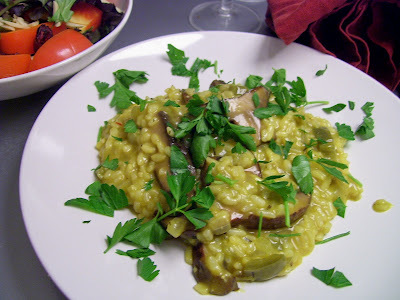 Initially, I was thinking of making a creamy mushroom and pea risotto dish using my pressure cooker (see note below). So, on my way home from tennis, I stopped at the grocery store to pick up a bottle of white wine and some portobello mushrooms. While preparing the dish, though, I ended up not using the frozen peas I had. Rather, I used a green pepper that I had to use before it went bad. For seasoning, I added dried thyme and a generous pinch of saffron. The end result? Pretty darn good, if I do say so myself. And it took about 30 minutes from start to finish. In the pressure cooker pot, melt 1 tablespoon of butter over medium heat with the olive oil. Add the onion, garlic, and the green pepper. Mix with a wooden spoon until the onions become soft, about 2 minutes. Add thyme, the arborio rice, 1/2 teaspoon of salt, and 1/4 teaspoon of pepper and stir, about 30 seconds. Add the wine and continue stirring until the rice nearly absorbs the wine, about 1 minute. Add the vegetable broth and the saffron and stir. Cover the pressure cooker and increase the heat to high. Once high pressure is achieved (15 psi), reduce the heat to low-medium, and maintain that pressure for another 6 minutes. As the rice is cooking, melt the remaining butter in a skillet over medium to medium-high heat. Add the mushrooms and continue cooking until they become soft, 5-6 minutes. When the rice is done cooking, release the pressure naturally (as opposed to under cold water). Open the pressure cooker. Add the milk, and stir in the grated cheese and the mushrooms. Add salt and pepper to taste. Serve with chopped parsley on top. Pressure cooking risotto is a wonderful thing to do. I cannot and do not eat green pepper, so I'd leave it out, and add the frozen peas at the very end, after taking the lid off the cooker. Risotto made this way often shocks people. Tomorrow I teach a pressure cooking class and will show risotto with saffron, asparagus and green garlic. It's all good. You can check out my blog at http://www.pressurecooking.blogspot.com.